The intriguing shape of the comet was first seen in detail by Rosetta in July 2014, and planetary scientists wondered if it formed from the erosion of a single object to create the “neck” of the comet, or if two separate objects collided and became joined together. Now it seems that the latter is the explanation. High-resolution images taken between Aug. 6, 2014, and March 17, 2015, were used to study multiple layers of material on the comet’s nucleus, which showed that shape resulted from the low-speed collision of two previous, separate comets. “It is clear from the images that both lobes have an outer envelope of material organised in distinct layers, and we think these extend for several hundred metres below the surface,” said Matteo Massironi, lead author from the University of Padova, Italy, and an associate scientist of the OSIRIS team. “You can imagine the layering a bit like an onion, except in this case we are considering two separate onions of differing size that have grown independently before fusing together,” he added. Over 100 layers, or terraces, were seen in the images, as well as parallel layers of material in exposed cliff walls and pits on the surface of the comet. Massironi and his colleagues then created a 3-D model of the comet to determine what directions the layers were sloping and estimate how they extended deeper into the subsurface. The result was that the layers were coherently oriented all around the comet’s lobes and in some places extended to a depth of about 650 metres (2,132 feet). The new results have been reported in the journal Nature and were presented yesterday at the European Planetary Science Congress in Nantes, France. So how does this show that the comet formed from an impact of two other objects? According to the scientists, layers of material should form at right angles to the gravity of an object. The team used two comet models to test their ideas, the first with the comet as a single body with a center of mass close to the neck, and in the second, as two separate comets, each having its own centre of mass. They found that the model with two separate objects fit the observations, with the orientation of a given layer and the direction of the local gravity being closer to perpendicular in that model. The team also observed, however, that while erosion by itself doesn’t explain the double-lobed shape of the comet, it does still play a role, accounting for variations in the surface structure. That can happen when different rates of sublimation (ice turning into gas) of frozen gasses are not distributed evenly through the body of the comet. 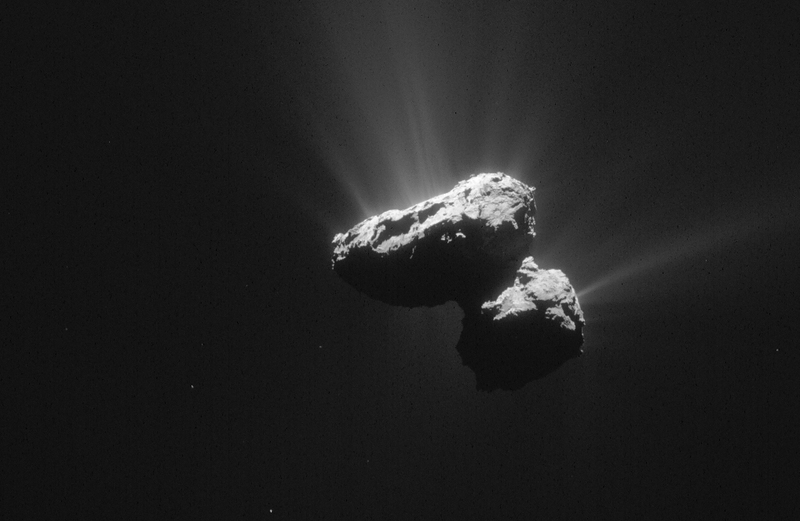 The findings shed important light on how comets, including 67P, form. “How the comet got its curious shape has been a major question since we first saw it. Now, thanks to this detailed study, we can say with certainty that it is a ‘contact binary’,” said Holger Sierks, OSIRIS principal investigator at the Max Planck Institute for Solar System Research in Göttingen. The Rosetta spacecraft also recently observed “dramatic and rapid changes” on the surface of Comet 67P as it orbited closer to the Sun, with unusual circular features forming on the icy surface in the Imhotep region which then expanded and combined to form a new, larger circle. The changes show what an active and evolving body the comet is as it is warmed by the Sun. Rosetta studied the comet closely during perihelion, the closest point in the comet’s orbit to the Sun, on Aug. 13, 2015. It was the first orbiting spacecraft to observe a comet close-up during that time. Earlier, Rosetta had watched as the comet blasted out huge amounts of water, helping to form the spectacular jets of water vapor, gas, and dust that comets are famous for. Rosetta continues to orbit Comet 67P, making further detailed observations of this fascinating body, which is a relic from the early formation of the Solar System. Such primordial chunks of rock and ice, like comets and asteroids, help planetary scientists better understand how the Solar System formed and the conditions that allowed life to form on Earth and perhaps elsewhere as well. “The two independent and primitive envelopes of the bilobate nucleus of comet 67P/C-G,” by M. Massironi et al., was published as Advanced Online Publication on www.nature.com today. More information about the Rosetta mission is available here.